1. KITS. I know it’s fun to do projects and learn new things. This is not something I would recommend for that adventure, unless you are really confident on your sewing machine. If you purchase a kit, be wary that the company sending it to you probably isn’t spending the high dollar for better quality material to send you. You often don’t have much in the way of choices for sashing, border or backing, they simply send you a packet after you pay and you do your best to follow the instructions included. They may not be sending you all the necessary materials to make a quality, lasting product. 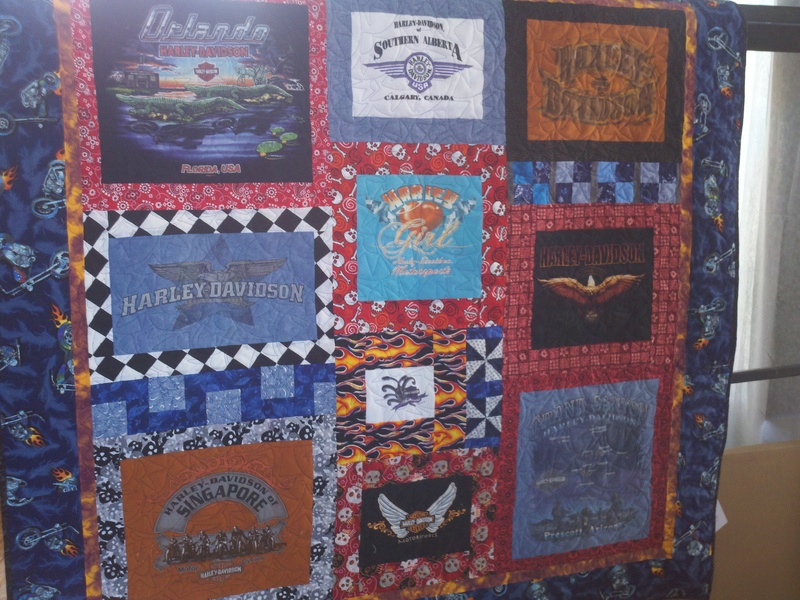 The picture below features a Harley t-shirt quilt I made with each shirt block having a border, rather than using sashing. This works best for t-shirt quilts with similar colored shirts, or repeating themes (i.e. breast cancer walk shirts). But it’s a fun option you don’t have available with a kit. 2. LOW PRICE means you should be suspicious. And no, I don’t say that so people will come to me if I charge more than others. I say it because I have come to find that I generally get what I pay for. I mentioned above that all the necessary materials may not be included; I was referring to stabilizer. It’s a thin iron-on material that keeps the double jersey knit of a tshirt from stretching when you sew it. If that isn’t used, the quilt will quickly become misshapen. If you want it quilted, your quilter will cringe – these tops allow the shirts to shift around and beg for bubbles, folds and lumps in your quilt. 3. LOW PRICE (MORE) can also mean that your t-shirts will all be blocked together like big giant tiles. If the shirts are not very large, the decal or motif from the shirt will not cover much of that square. This could also indicate your quilt maker is only providing you the top, not a completed product. Batting (the center stuff) backing, the labor and materials for binding and quilting the product are all omitted from the price. Be sure you are aware of what the price really means. 4. “I HAVE 16 SHIRTS…”. Ok… I say this because many t-shirt quilt creators charge by the number of shirts. Do they really mean number of panels? Does that mean that no matter the size of the panel or final quilt, it’s about the number of shirts? While I don’t personally agree with this philosophy, it works for many people. 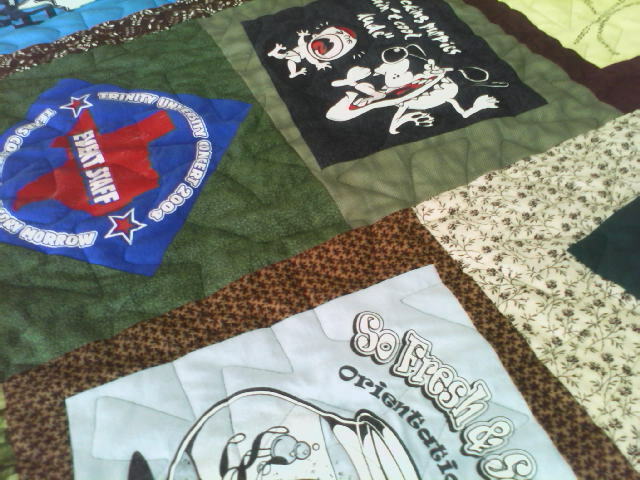 Be aware that your t-shirt quilt maker may make assumptions, like that you want the front or back only from each shirt. The queen size quilt pictured here was constructed from 17 shirts (button down, t-shirts, sweatshirt) – I used the front and back panel from each and the sleeve from 2. Bottom line = if you find the right quilt maker, you will be happy with the result. That person will help you to ask the right questions to ensure they know what you want out of the transaction. 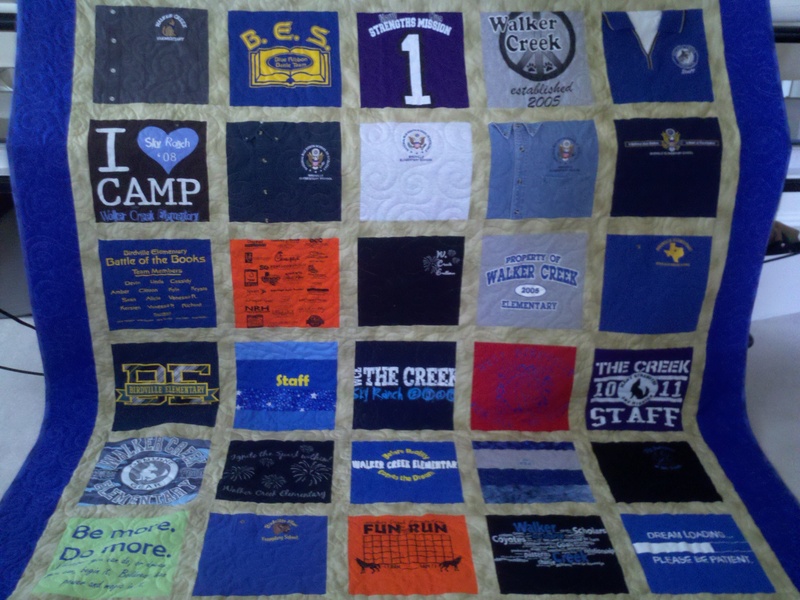 T-shirt quilts can be made out of any number of shirts, any size, even with traditional blocks tossed in here or there. I will be posting instructions on t-shirt quilt assembly in the near future. If you have specific questions feel free to ask! Happy quilting! This entry was posted in quilt preparation and tagged how to make a quilt top, how to make a t shirt quilt, how to start a quilt, t shirt quilt, tshirt quilt. Did you notice if the interest in T-shirt quilts increased when Bella was presented with a T-shirt quilt from her mom in the movie Twilight? I’ve been wondering about this for awhile and just remembered to ask you when I saw this post. I’ll have to ask some friends – I wasn’t making t-shirt quilts at that point. But it could be so! !